My oldest son occupies himself easily, probably because he was an only child for 11 years. My husband doesn’t struggle with boredom either. Not only can they always find something to do, but they can have the same, basic routine for years on end without getting bored. So where do I fit in all of this? I’d like to say I’m somewhere in the middle and that I provide the balance between the two extremes. I’m not, and I don’t. Like my youngest, I too get bored easily. And if I’m brutally honest with myself, I will admit that this is the real reason my son’s boredom drives me crazy at times. He gives me an all-to-real visual of what I’m feeling on the inside. While I don’t wander when I’m bored, well not every time, and I don’t usually bounce from one task to the next, I do struggle with sameness. The same routine. The same clothes. Same hairstyle. Same food. Day in and day out sameness. My day scripted. Little variety. Boredom. 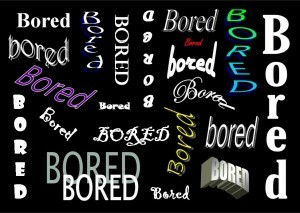 I said all this to say that I have a propensity for boredom. It’s just a part of my personality that I must constantly keep in check. I have learned that when boredom shows up, I need to address it quickly before it grows into something more serious. Which is what I failed to do over the past three months. Lately, church, Bible study, fellowship, relationships, you name it, have become monotonous to me. I have this general feeling of boredom with life that I can’t shake. I feel stuck. Boredom has intensified to the point that I know a more serious issue is at play. This is about something going on, or not going on, in my heart. I’m not stuck in the motions of religion because church and the people I spend time with are boring. Couldn’t be further from the truth. In fact, I would be hitting this wall of boredom no matter where I attended church and no matter whom I spent time with because the problem is in my heart not my church or other people. I’m not bored from a lack of stuff to do either. I’m a mom of two junior high boys and a work-at-home writer with a husband who travels often for work. I have stuff to do. When I read that description, I knew that my boredom was really indicating a flat faith. I realized that I was going through the motions and that I definitely lacked passion in my faith. Kathy also talks about how a flat faith “derails God’s purpose for our lives” and that “we don’t have to settle for flat, dry faith.” I certainly felt derailed, and I was definitely settling and desperately didn’t want to be. This series is a journey through the elements that appear to be the root cause of my flat faith, lack of connection (Part II) and a focus on comparisons (Part III). Part IV focuses more on boredom, and Part V details my Boredom Battle Plan. The Holy Spirit will guide me on this journey. Kathy will be along as well. Will you take the journey with us too? DISCUSSION: What is a telltale sign for you that some spiritual adjustments are necessary? Note: Unless otherwise indicated, all direct quotes are taken from “Flat Faith” by Kathy Howard. Also, be sure to heck out Kathy’s guest posts Flat Spots Here and There – Part I and Flat Spots Here and There – Part II. This entry was posted in Victory! and tagged bored, boredom, Flat Faith, journey, kathy howard, spiritual adjustments by admin. Bookmark the permalink. As a pastor I am expected to be "on top" all the time. Nothing can be farther from the truth. If they only knew how many times I have punched my chair in frustration during another dull prayer time. Another "are you there God?" time. That is probably my biggest indicator that things are not "all well in Bill land." I look forward to taking this journey with you. Those sorts of high expectations sure can put a lot of pressure on a person. And pastors have to often keep up a front, which just adds to the pressure. Glad to have you along for the journey both for your benefit and for the insight you can bring from a pastor’s point of view. Seeing my pastor as human only makes me respect him more as he struggles to live a life of faith just like the rest of us. I do not have a problem with boredom. I think it helps that I like trying new things; learning how to do something different; and trying to improve on what I do. I think when I feel my faith getting flat it helps me to try to think of some tangible ways I can reach out and help someone. I try to do it anonymously. There is something about helping others that brings passion into my faith. The fact that I can make a difference I am sure is part of it; being used by God is another; and perhaps it helps me understand more about myself. I am curious, how do you know when your faith is getting flat? What alerts you? Reaching out to others & connecting are what I need to do more of when my faith starts feeling flat. I need to cultivate that habit, but I first need to break the habit of keeping to myself when I am struggling. Interacting with others is one of the major ways God teaches us about ourselves and helps grow our faith. Mark, I think what you've said about helping someone else in tangible ways is so key. One of the "action" chapters in the book is about sharing our faith. It is so exciting to have a front row seat to what God is doing in someone's life – especially if we get to witness new spiritual life being born! It sure pumps up my faith! Great post, Kari. I am definitely in the "fighting boredom" category as far as life goes, but not where my faith is concerned. I love spending time with God, I think in part, because I always have some sort of renewing of the mind project going. I like personal growth, and I like going to God for help with it. Plus I just love the Bible in general. I DO struggle with plenty of other weaknesses, though! I know I need to go to God for a readjustment whenever I'm in emotional turmoil – even if it's just a slight turmoil. Sometimes that turmoil is caused by discontentment and boredom. Then I know I need to remember what life is about – loving God and others. Excitement from a biblical perspective is so different than excitement from a cultureal perspective! Thanks, Barb. I love spending time with God too, even when I am feeling bored. Just the way I do it gets monotonous and times, and I need to change it up, if that makes sense. We all need God to readjust or realign or whatever we want to call us from time to time. And, sometimes the reasons/causes are the same old patters we thought we defeated, and sometimes they are new ones. We need to keep in the Word to keep those from overtaking us. I like what you said about excitement from a biblical perspective being so different from excitement from a cultural perspective. That is SO true! One is sustaining, the other isn't. One is secure and consistent, the other is fickle and shaky. Great point! Boredom is a result of monotony… we may be doing a lot of things, but we can get into a rut of doing them the same way at the same time, which is like a well worn path in the woods. The path becomes comfortable and safe to us until we realize that we are walking the same path, the same way each day and the grass underneath our feet is dead. Initially it helps us find our way, but the path is the same all along the way. We lose the adventure and surprise until we venture off the path. Remember a grave is but a giant rut with the ends blocked off. Change the what, where and how of things you are doing. Break some habits that have formed and caused you to be bored because the results have become predictable. Some of us like predictability, some do not – some thrive on the well worn path, others prefer to forge new paths. Well said, Mike. Some of us do like predictability and others constant change. Seems like most of us are a combination of the two though. Comfortable in order to be uncomfortable. Consistency in order to change. The ultimate destination may be the same, but there may be more than one path to follow or to create anew to get you to the end. It is never the means that justify the end, it is always the end that justifies the means. The why should remain consistent, and that includes our Bible time, our prayer time, our relational time! Allow God to stir things up in your life…He loves change and is the change business – in fact He is the author of change! Changed lives, changed hearts, changed attitudes, etc…. 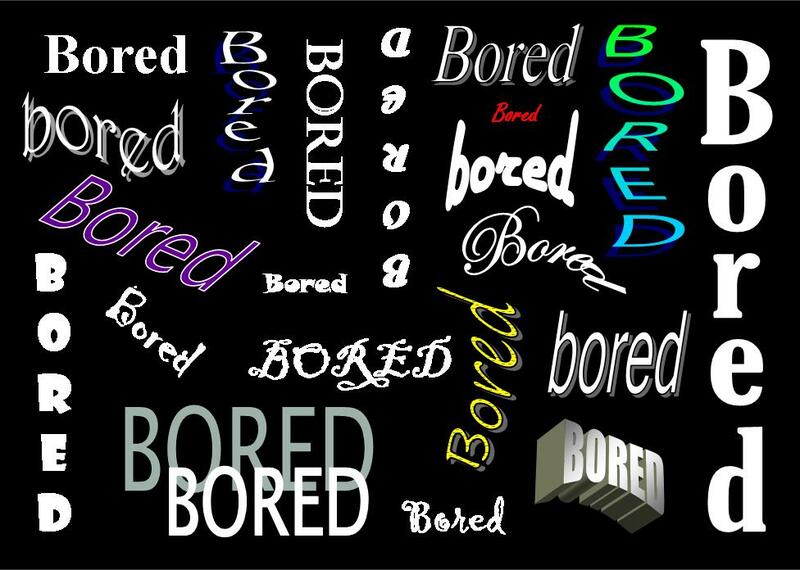 Boredom is God's messenger for change! Consistency with the fundamentals, as you know from being a coach, is essential to finishing strong and to having good stamina for the whole race. Your last line says it all for me: "Boredom is God's messenger for change!" Mike, I like what you say about change. God is always working! He is always up to something! I can tell when things need changing by my responses to the situations around me. Using a variety of blogs, books, and devotionals help me not get bored with doing one thing over and over. I like predicatblity to a point, but when things start to get boring I like a LITTLE change. Light from the Word devotional talked about how temporary trials and struggles in this life are just that TEMPORARY, and God wants us to focus on the eternal. The book One Thousand Gifts has really helped me look for "gifts" or blessings in each day and be thankful that God sees a much bigger picture than I do. While you are doing Kathy's study, I am doing "A Confident Heart" with Renee. She writes that our story, no matter how messy it may seem is important and in the sharing we may bless and help others. Thanks for having the courage to share your journey with us! I don't know about the rest, but i don't find you boring in the least! 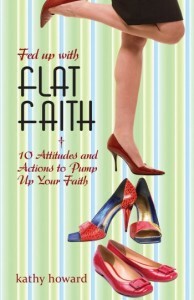 Kari, thank you for sharing your thoughts about "Fed Up with Flat Faith." I look forward to sharing your journey! As I've mentioned to you already, getting the book was perfect timing for what the Holy Spirit needed to say to me. Love God's timing so much better than mine! Kari, fantastic topic. I love how transparent you are. Sometimes a flat faith is an indicator of depression or poor health. I have had times of flat faith when I am feeling obligated to pray or read Scripture in a certain way. I really avoid rules now because they're such a passion killer for me. I also think that judging my passion for the Lord is a boredom inducer. If I feel like I'm never good enough for God, I have no interest in spending time with Him. Thanks, Melanie. Depression & poor health definitely can have a huge impact. A focus on rules does too. Can personally relate to the impact of all of those. Anytime our focus gets off of Jesus, our faith goes flat. And, there is a myriad of reasons we lose focus. So thankful for the Holy Spirit constantly drawing me back to Him. I too, get bored without change. I felt like my faith was flat for many years. My faith was there, but it was not emotionally exciting. I often connect faith and emotion. Can anyone else relate? Can definitely relate. Have the constant battle between what I feel and what I know or think I know. Learning to act outside or regardless of emotion is tough. But, sometimes emotions need to play a role. Balance, I guess. Let me know if you figure that balance out, even if just a little bit. Kari, God has been teaching me to always put His truth ahead of my emotions. Of course He also gave us our emotions. The best thing to do is take our emotions to God and ask Him to confirm or adjust them. Scripture is full of God's people going to Him with their emotions! So glad to have you along! Don't go looking for boredom, my friend. There are certainly enough other struggles to contend with, especially when you have close loved ones who are unsaved. I need to add them to my prayer list. Getting more involved really has more to do with being connected (tomorrow's post) than it does with keeping boredom away. Scripture tells us over and over that connection is vital for a Christian to have a healthy spirit. Vital. As in not optional. Let me know if you want to chat about the "getting involved" thing more. Lots to say there, I have. For me, a telltale sign is my personal devotional life. When it gets stagnant, slow, or lacking – then I know there's a passion issue somewhere that needs to be addressed. I believe this area has telltale signs for everyone!